Hi all. I haven’t been blogging for a while, partly because I wasn’t sure I had anything new to say. But the “opioid crisis” is obviously on everyone’s mind. So, I wanted to get the facts straight, and I pitched an article to The Guardian, published yesterday, based on what I found. The response has been slightly overwhelming: more than 500 published comments in less than 24 hours (plus some emails to me personally). Most moving to me is the gratitude expressed by people in serious pain, people whose access to needed medication is being quickly cut off by the hysteria concerning the overdose epidemic. The point of my article was that most of the opioid panic is fueled by a misguided perception that opioid pharmaceuticals, prescribed and taken by patients in pain, is this diabolical force behind the wave of deaths. I am in no way minimizing the tragedy of the overdose epidemic. But as most of you know, fentanyl and its analogues are the primary cause. But here — I’m pasting the article below, with a few additional thoughts, plus a graph from the NIH/NIDA website that helps tell the story. Or read the article in The Guardian and peruse the comment section. There’s a lot of painful reality (plus a lot of stupidity, as usual) revealed by these comments. Makes me feel good about what I wrote. “The news media is awash with hysteria about the opioid crisis (or opioid epidemic). But what exactly are we talking about? If you Google “opioid crisis”, nine times out of 10 the first paragraph of whatever you’re reading will report on death rates. That’s right, the overdose crisis. The overdose crisis is unmistakable. I reported on some of the statistics and causes in the Guardian last July. I think the most striking fact is that drug overdose is the leading cause of death for Americans under 50. Some people swallow, or (more often) inject, more opioids than their body can handle, which causes the breathing reflex to shut down. But drug overdoses that include opioids (about 63%) are most often caused by a combination of drugs (or drugs and alcohol) and most often include illegal drugs (eg heroin). When prescription drugs are involved, methadone and oxycontin are at the top of the list, and these drugs are notoriously acquired and used illicitly. Yet the most bellicose response to the overdose crisis is that we must stop doctors from prescribing opioids. Hmmm. Certainly some doctors have been prescribing opioids too generously, and a few are motivated solely by profit. But that’s a tiny slice of the big picture. A close relative of mine is a family doctor in the US. He and his colleagues are generally scared (and angry) that they can be censured by licensing bodies for prescribing opioids to people who need them. And with all the fuss in the press right now, the pockets of overprescription are rapidly disappearing. First, why not clarify that most of the abuse of prescription pain pills is not by those for whom they’re prescribed? Among those for whom they are prescribed, the onset of addiction (which is usually temporary) is about 10% for those with a previous drug-use history, and less than 1% for those with no such history. [Thanks to Maia Szalavitz for highlighting these statistics.] Note also the oft-repeated maxim that most heroin users start off on prescription opioids. Most divers start off as swimmers, but most swimmers don’t become divers. Second, wouldn’t it be sensible for the media to distinguish street drugs such as heroin from pain pills? We’re talking about radically different groups of users. Third, virtually all experts agree that fentanyl and related drugs are driving the overdose epidemic. These are many times stronger than heroin and far cheaper, so drug dealers often use them to lace or replace heroin. Yet, because fentanyl is a manufactured pharmaceutical prescribed for severe pain, the media often describe it as a prescription painkiller – however it reaches its users. By the way, if you were either addicted to opioids or needed them badly for pain relief, what would you do if your prescription was abruptly terminated? Heroin is now easier to acquire than ever, partly because it’s available on the darknet and partly because present-day distribution networks function like independent cells rather than monolithic gangs – much harder to bust. And, of course, increased demand leads to increased supply. Addiction and pain are both serious problems, serious sources of suffering. If you were afflicted with either and couldn’t get help from your doctor, you’d try your best to get relief elsewhere. And your odds of overdosing would increase astronomically. It’s doctors – not politicians, journalists, or professional review bodies – who are best equipped and motivated to decide what their patients need, at what doses, for what periods of time. And the vast majority of doctors are conscientious, responsible and ethical. Pasted from a page on the NIH/NIDA website. I once agreed with that conjecture. And anyone familiar with statistics should know that correlation does not imply causation. Comparing income levels, early abuse, with addiction does not necessarily demonstrate any correlation-ship, but that further examination of the problem is needed. Other variables that weren’t factored in could be driving all the examined variables. There are other species of animals that can experience addiction. It is unlikely that they were afflicted with difficulties in their juvenile stage, or experienced poverty. In fact, lab rodents become addicted to various drugs and are used to study addiction. Note that alcohol is only addicting to certain individuals, while continued use of opiates results in deep cravings for more of it in virtually everyone. Going beyond psychology and economics, other variables would include neurobiology, genetics, and in-utero exposure to various chemical/pharmaceutical products ingested by the mother that we normally wouldn’t expect to find in the natural world, such as over the counter drugs and food additives. there are no easy answers to addiction. I should think being born and raised in a science lab could be a difficult experience for a rat! But Marc isn’t saying there are any easy answers. He’s just saying that stopping doctors from prescribing opioids is barking up the wrong tree. But correlations DO imply causation…that’s why they’re interesting. But they don’t prove causation, and your point about a third variable is well taken. I dispute what you say about rats. Alexander’s Rat Park studies demonstrate that rats who are socially deprived as those prone to drug addiction. I also dispute what you say about everyone falling for opioids. Please read my article carefully. The 1% and 10% figures are not fantasy. In a nutshell, many people don’t particularly like the opioids they’re prescribed for chronic pain. They need them for pain relief. Period. And I wouldn’t exactly call “neurobiology” a causal variable. It’s a mediating variable. It mediates EVERYTHING. But you’re very right that there are many complex interacting causes at work. I for one, never was an abused child or suffered a traumatic experience leading to addiction. I was curious in adolescence and enjoyed taking my mind to another level. Eventually that got out of hand. When addiction set in. I don’t know, my chemical make up? Why an addict? In my case….who knows. Cheryk, yes, same with me. Most of the people I met in recovery groups initially found drugs/alcohol initially seemed to make a good life, even better. And recovery was not simply realizing it ultimately doesn’t, but also losing the feeling that comes with beliefs like that. Although not often said in recovery programs, people seem to find there is no need to maintain or restrict oneself from something no longer wanted, because the feelings themselves have changed, not just the mind or beliefs. the war on drugs is killing people now at an alarming rate as we more and more remove less harmful alternatives which are then replaced by illicitly manufactured drugs which are simply too powerful for many people to handle. heroin itself would not cause this much of a problem. In Australia early next year low dose over the counter codeine based analgesics are being banned from sale in chemist without prescription, this in response to a couple of deaths blamed on these and hysteria about supposed (yet another) “epidemic” of addiction. the overreaction, similar to that Mark describes now means people have to go to a doctor to get a script – those who do will get Morphine instead of codeine and many will simply seek what will became black market codeine. while ever the War continues more and more harm is caused yet does any government anywhere accept blame for these deaths. Its not just the Philippines openly killing drug users without much ado. I am a student at UC Davis Marc where I am taking an intro neurobiology course titled “The Biology of Addiction”…. not too far off from the title of your book. We have been going over the opiate crisis and when the professor was showing us rates of opiate overdoses I asked if those charts were featuring people who died strictly of opiate overdose or because of drug intoxification (combining opiates with other substances). She did not have an answer for that one. She is definitely into the whole idea that addiction is a disease, and when I asked her from a disease model perspective, what kind of changes have to occur in the brain for someone to become “un-addicted” (to recover), she explained how new synaptic pathways have to form, which made me wonder, how can you call it a chronic, progressive, and fatal disease? It seems like the prescription opiate issue a crisis is a microcosm for the whole disease model approach. If we blow this up to be something bigger than it really is, we can get more money thrown at it, which will get more treatment. I agree with what you said in your book that, the kind of treatment we prescribe for addiction is more important than being able to supply mass treatment based on refutable science. I agree with your perspective, Will, and I’m glad you’re challenging your seemingly ill-informed professor. But to play devil’s advocate, sort of: the hysteria could have a bright side by focusing the public’s attention on the longstanding problems of addiction in society…very much like mass shootings focus attention on America’s absurd gun laws (or lack thereof). So many more people die from gunshots inflicted in the bar or the bedroom…the mass shootings are a fraction of the total. But they sure do galvanize attention. I agree. Shutting down the most convenient source of opiates is likely to drive more people to stronger opiates, many of which will be attained illicitly. It’s a terribly short-sighted strategy. Yes, and the endless surges of addiction epidemics derails comprehending what addiction is. If addiction is viewed as something that has, and will all ways will exist, then would be better comprehended by professionals and the Public alike. If the endless surges of public fads, stampeding fans, etc, were considered epidemics, the understanding of addiction could be re-considered. But the carnage and tragedy of addiction is so real and serious, it is hard to imagine the source of addiction to be anything but something horrible and evil too. Very good points, Carlton. As I say in my comment above, hysteria can have the benefit of pointing attention to endemic problems. But unfortunately it usually leads to short-sighted solutions for those problems. And as you say, this idea of “evil” pops up way too easily, as if reality works like a comic book. Great post, Marc. (Although you may have a little more general faith in doctors’ ability to prescribe opiate pain medication appropriately, than I). You are right on. I would add that mixing benzodiazepine with heroin is another regular combination that is contributing to the current overdose problem. Although I strongly believe that markets and profit play a huge role in the wanton deluge of opiate drugs we have seen wash over (specifically) America, this has also happened during a time when we seem incapable of nuance. In the current American climate, all important discussions seem to fall prey to extreme either/or deliberations. This leads to extreme pendulous changes which will probably turn the opiate overprescribing problem into an underprescribing, one, before, hopefully, balance is achieved. This may be due to another market, the privately operated media, which needs to turn all information into a sellable dramatics, furthering the tendency to come to extreme stances that run roughshod over the ability to have more nuanced understanding such as the points you make here. But before I turn this small rant into a big one, I hope that there will be more balanced discussions surrounding both of these important, related-though-seperate, topics. Really insightful analysis, Eric. It’s true that the media’s allergy to “nuances” is a big factor contributing to the either/or thinking. Either opiates are incredibly useful pharmaceuticals or they are poisoning and killing Americans like some kind of plague. And yes, the current bias against opiate prescribing will end up — in fact is already — contributing to an underprescription crisis. As I note, that’s exactly what happened last century. Panic leads to pressure leads to policy shifts that make little or no sense. Look at some of the comments to the Guardian article. There are a lot of people desperate to continue to treat their severe pain with effective drugs — notably opiates. Marc, you may be privy to this part of the storyline already, and it has to do with the opioid problem, not specifically the importance of separating it from the overdose problem, but it deserves attention during any part of this discussion. This article really shows how the pharmaceutical industry has been able to knowingly mislead the public about the potential dangers of their products. This is a big part of what has led to the problem, and the subsequent overreaction leading to the under-prescribing of legitimate pain medication. Yes, I’m familiar with the Sackler/Oxycontin story. But good that you posted this. Still, I find that this story is used preferentially by people who want to combine an anti-pharma argument with an anti-opiate argument. That doesn’t wash for me. It’s a giant conflation. Big Pharma is guilty of immense misconduct in all sorts of ways. Advertising drugs to patients is intrinsically evil, canvassing and paying off doctors is evil, biasing research on meds under development is evil, and so of course is the suppression of research findings contradicting the benefits that companies want to tout. All of this is well documented. In short, I think the whole system stinks. But why would biasing the story on opiates be any different or any worse than biasing the story on antidepressants or any other drug family? In my (utopian? naive?) view, the linkage of huge profits with health-care is the source of a whole mess of problems. Marc, Point well made and well taken. I was hesitant to bring this part of overall discussion into this specific piece of it, and I do see how this obvious and major profit propelled issue could be used to discredit the proper use of opiate pain medication, as a whole. Certainly I didn’t want to derail or confuse what is a very important point. Hey, it was good of you to bring this to our attention. That way we can all work at sorting out the issue of Big Pharma=evil vs. Big Pharma=opioid epidemic. This is important. Thanks for airing it. In your PS to this post, Marc, you say: “I just want to clarify that I don’t see you, me, us addicts — former or “active” — as villains in this scenario. Yes, we do “divert” pain pills to deal with our (sometimes enormous) psychological vulnerabilities. But we only do that because our back is against the wall. 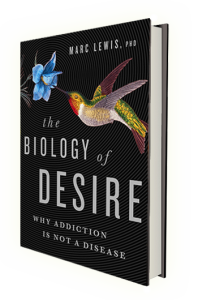 Only because there’s no other choice.” As other responses have noted, addicts – however defined – can and do make choices and neurophysiology, like genes, is not the same as destiny. For example, the seemingly very low incidence of serious drug abuse in Cuba doesn’t appear to come at the cost of lots of obvious misery among adolescents or high suicide rates. I’m not suggesting Cuba is a realistic model for Western countries but both availability and social attitudes surely have something to do with the rarity of drug abuse there, even though Cuban kids also experience typical family traumas and losses while growing up. Alcoholism rates increase or decrease with changes in the availability of alcohol and availability is surely one factor in initiating opiate use. The over-prescribing of addictive analgesics, fuelled by the US fee-per-item health system and direct-to-the-public drug advertising, accounts for some of the problem, even if fentanyl analogues make it more lethal than hitherto. I can’t argue with anything you say, Colin. And as you know, I strongly endorse a “choice” model of addiction…even though I don’t see choice as a simple, monotonic process. And yes, availability is a factor in addiction rates. In fact, I’m surprised that Percy Menzies hasn’t piped up yet. He may be too enraged with me to respond quite yet. So, yes, I’m guilty of ignoring correlations between access and addiction, in service of making my main argument in this article. But your comparison with Cuba just seems irrelevant to me. Latin-culture countries have stronger family bonds than many pockets of the American population. Depression and anxiety are enormous problems in the US, counting for the most serious depletion of public health money, loss of productivity, and loads of other spin-offs that can’t be measured financially. Depression varies with lots of factors, but the extremely weak social safety net, almost nonexistent family support services, broken health insurance industry, high poverty (second highest child poverty in the developed world), incredibly high rate of incarceration, high incidence of family violence, and the high ACE (adverse childhood experience) scores that reflect some of these problems are just facts of life for this somewhat blighted society. Drugs are also highly available in Portugal, as you know, but addiction rates have dropped to almost nil because of a thoughtful and humanistic shift in addiction treatment policy weighted toward support rather than stigmatization and punishment. So….where depression and anxiety are highest, more people are more desperate to find relief. As far as I know, suicide is still the second highest cause of death for Americans between 15 and 24. I doubt that Cuba comes anywhere close. It appears that wider legal delivery of pain pills *may* have created marginal, opportunistic addictions where the patient is introduced to opiates for a good reason and then becomes dependent seeking more pain relief after the initial reason for physician supply has been resolved. While these people are addicts they seem different from our determined population of addicts who have sought this life intentionally and directly through Heroin for example. I do not know but I meet “addicts” now who have some sort of life other than drugs and are not physically wasted by the habit and associated illnesses. Could this be producing more rehabilitations that are permanent and not aimed at reducing costs and toleration? Perhaps someone is familiar with this issue- the addition of random opportunistic addictions applied to personalities NOT inclined by some strong predisposition more common among long term street junkies. I think we have to bear in mind that *pain avoidance* as the flip side of the *pleasure principle* is THE mechanism we employ for sublimation to pro social activity and that opiates seem to directly and massively short circuit this complex system of arbitrage and delayed gratification. A person would have to be very firmly conditioned as a member of society to accept the presentation that direct injection of opiates might not be the optimum solution in an atomized society. People interested in addiction can also remain politically alert and recognize that many of our ‘leaders’ are psychopaths on the public and private side of very large organizations and in my view this can be added to the overall picture. While it is not available it would be very interesting to see full personal histories of the people who are being killed by by overdoses. I understand the power of Fentanyl and the lack of accurate dosage and that some percentage of those killed might be a citizen with an opportunistic addiction associated with an auto accident or similar but who, WHO are all these dead people? I have seen numbers suggesting that those killed might add up to 140 people a day though who can be trusted for such a number? If the majority could be identified as problems for authorities – life long anti-social individuals with dim prospects it is past time to consider whether they are being killed indirectly by a policy more serious than benign neglect. Let us compare this situation with woundings and killings in Chicago which has a population of roughly 2.7M. So far in 2017 more than 3200 have been shot and over 600 killed. Occasionally it is mentioned that one of the killings is of a child intentionally or by wild firing. In about 88% of cases no one is even arrested and conviction rates are not maintained! WHO are these people who are being killed in particular neighborhoods in Chicago especially and WHO are all these people being killed by opiates? Are we to understand that their deaths are of no concern whatsoever with lives completely beneath any sort of notice? Governments, corporations, etc can only report the human experience as a function of statistics, complete with various graphs and charts. These give rise to notions of causes, which then present simplistic solutions, neglecting the huge variability between individuals. And possibly the “recovery” solutions become generalizations pitched at the seeker as if they are a generic specimen. I have known many persons down through the years that felt like a herd animal being shuttled about to various group activities in rehabs. Individual time with a therapist was about 30 minutes per week, if at all. And thus we may wish to ask of the living who seek recovery, WHO are YOU? Are you more than whatever labels were put upon you? How easy it is to forget that these are real people. Late getting to this but its surely one of the best youve done Marc. Great one Marc – so glad you weighed in on this important topic! I have many friends in the chronic pain community who are suffering terribly, both physically and emotionally due to stigma now. Thank you for writing this! I will share widely! (CNN) A new study finds that the number of Americans being diagnosed with opioid addiction continues to skyrocket, but still very few receive any treatment. This is in line with the rising trend documented in previous reports. An analysis from Blue Cross Blue Shield of its members found that from 2010 to 2016, the number of people diagnosed with an addiction to opioids — including both legal prescription drugs like oxycodone and hydrocodone, as well as illicit drugs — climbed 493%. In 2010, there were just 1.4 incidences of opioid use disorder among every 1000 members. By 2016, that rate had climbed to 8.3 incidences for every 1000 members. Yet, at the same time, there was only a 65% increase in the number of people getting medication-assisted treatment to manage their addiction. The trend charts I found, one of which is posted above, were compiled by NIDA. Since “illicit” drug use was fairly steady over the twelve years covered (true, it misses the last two years), I’d think opioid use would be a big proportion of that. 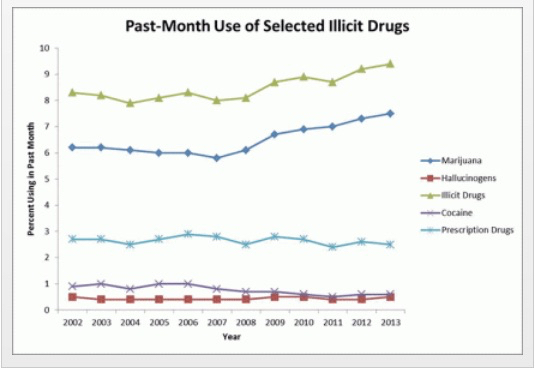 Also notice that the line representing “prescription drug use” is entirely flat. I want to look into this and figure out why your stats are so discrepant from the ones I included in my article. I figure there are major biases in reporting, especially among those with health insurance who can use insurance dollars to pay for rehab. Note that this was the sample for the stats reported in your study. I’ll get back to this more soon. In my experience also, overdoses are not necessarily planned by the individual but also not avoided. I think of a gentleman who made it into our program after his 12th overdose and 7th resuscitation by Naloxone. Although an extreme case, his mindset was of not minding either way what happened which I feel speaks more to the overall connection this person felt to the world and a need for control. Focusing on the human experience as a whole I feel is the most important. Society, families and even workplaces need to work together to allow us to reconnect with each other. This was a cool article to read. I agree with almost everything that it says, except the part about using a painkiller. Although this is not a popular thought, you want the pain to be there as it keeps you within your limits. The lack of pain could lead you to do too much, too quick. As a wrestler for 7 years I had plenty of stretched and strained muscles. These I rarely took anti-inflammatory drugs or painkillers. I can vouch for acupuncture as well as the little glass ball treatment that I got from a chinese medicine person (sorry I do not know the technical name of what to call them). This helped me to treat the injured areas, also I have spoken at length with a sports medicine chiro, and he said to not use the anti-inflammatory drugs either, as the swelling is part of the healing process. But I do agree with all of the other treatments in the article. I especially liked the idea of drawing the alphabet with the limb, I had not thought of that, I always just did circles and flexed the injury around.